Magnificent 120m ² apartment, located in the upscale neighborhood of Palm Beach in secured and closed residence next to the beaches. It offers all the comfort for an exceptional stay in Cannes. Perfect for delegates (3 minutes walk from the beach) and tourists (20 min walk to the palais des festivals). This 3 bedrooms well decorated, luxious and bright apartment, can comfortably accommodate 6 people. The living room / dining room with a flat screen and has a direct access on the large south exposed terrace and equipped with a table and 4 chairs with a nice sea view. The two otherz bedroom have two simple beds. There is two bathrooms, one with a bath and the other one with a shower, both are with wc. A kitchen fully equipped with everything you need to prepare your favorite dishes : oven, microwave, fridge, Nespresso, kettle, toaster, dishwasher. Naturally, you will have free WiFi access and air conditionner in all the rooms, as well as all the amenities facilities to ensure your stay with comfort : sheets and towels of quality, an IMMOGROOM welcome pack (coffee, tea, salt and pepper, oil, sugar, toilet paper, trash bags, etc. ), iron and ironing board, hair dryer, hangers, household equipment (vacuum, bucket, mop), as well as a washing-machine. The apartment is on the 2nd floor (with lift). The keys and badges will be given to you, on your arrival a person will accommodate you in front of the residence. At the very end of the Croisette, Palm Beach is a neighborhood, from one hand very calm and perfect to take a walk, and from the other hand, full of activity. This is the perfect place to enjoy some water sports (Stand-up Paddle, Kite surfing, windsurfing, kayaking, etc ...) and meet local people on public beaches. There is also the prestigious Plam Beach Casino and nightclub, as well as the famous Baoli, the Mecca of Cannes-by-night. La Croisette, with its beautiful private beaches and its worldwide known palaces is the symbol of French luxury. 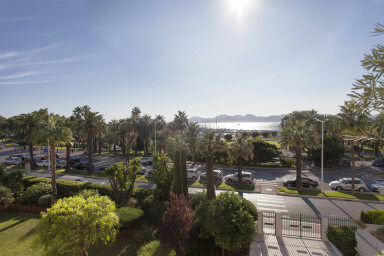 “The must” in Cannes, this prestigious promenade is also the ideal place for luxury shopping.